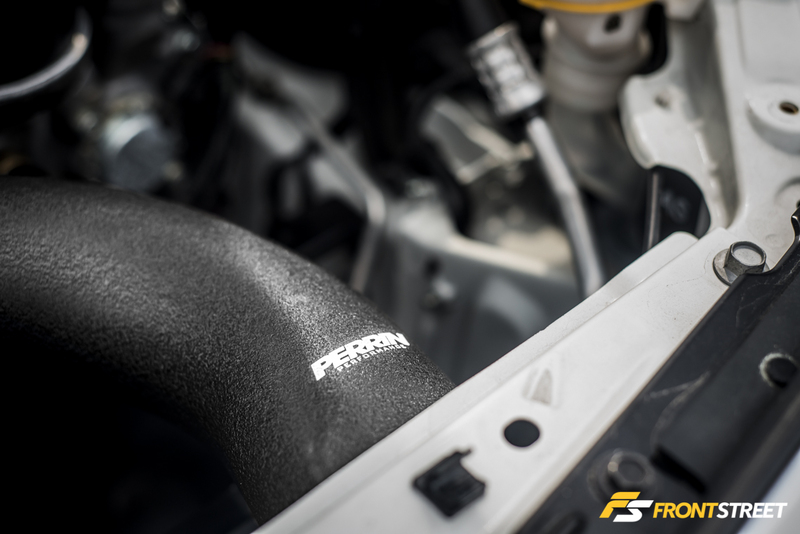 In the past many automotive manufacturers have strived to create the perfect sport compact chassis. Combining the balance of power and handling into a smaller attractive chassis has proved to be a difficult task. 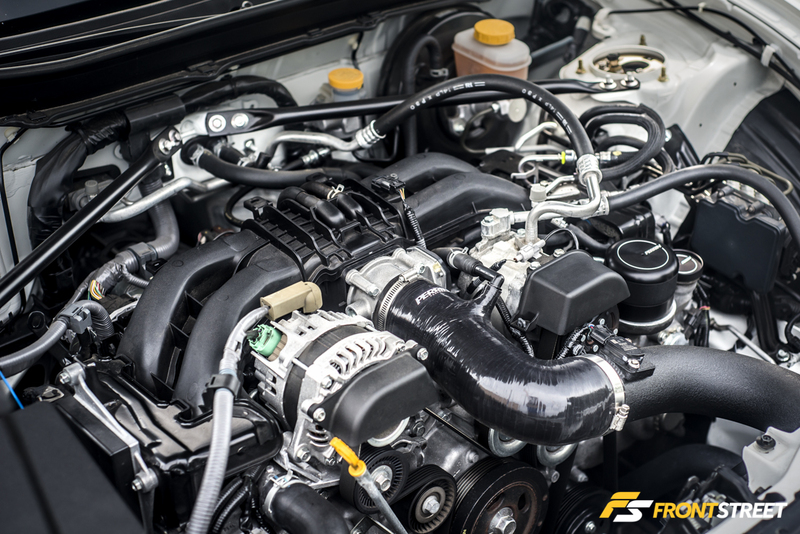 It took the collective design teams from Subaru and Toyota to create the tuning canvas of our generation, the Scion FR-S. 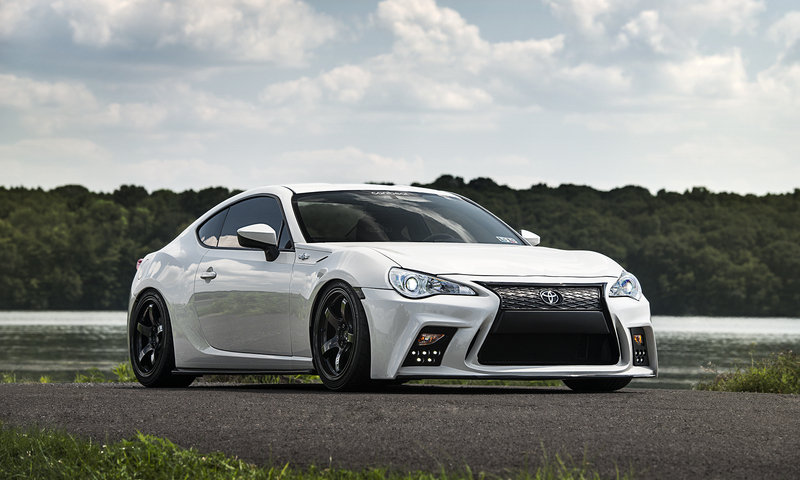 Since its release in 2013, the successor of the iconic AE86 Toyota Corolla has been modified in every way possible. The aftermarket has opened up to this chassis in a way that has never happened before. 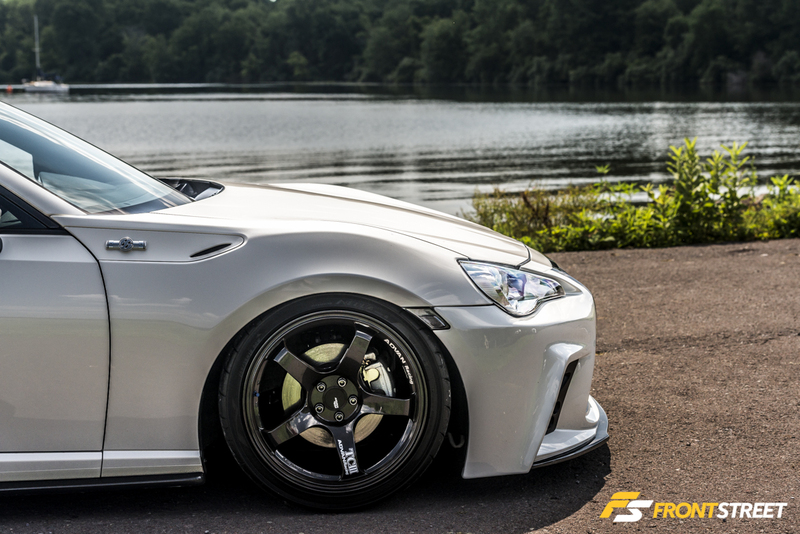 So when Jesse Rivera decided to sell his Honda S2000, the FR-S became the likely replacement. 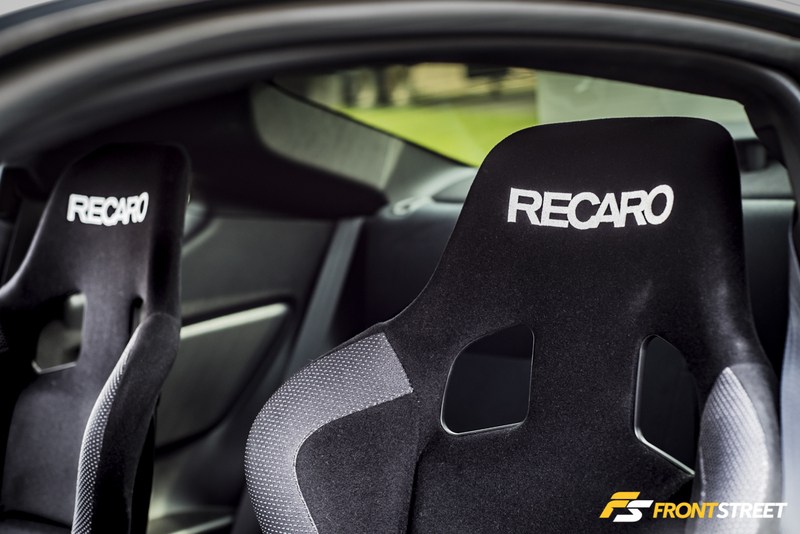 The S2000 was a great car for him, and he still enjoys them, except their limited interior space. Jesse, measuring in at 6’5”, felt restricted inside the small Honda sportscar. 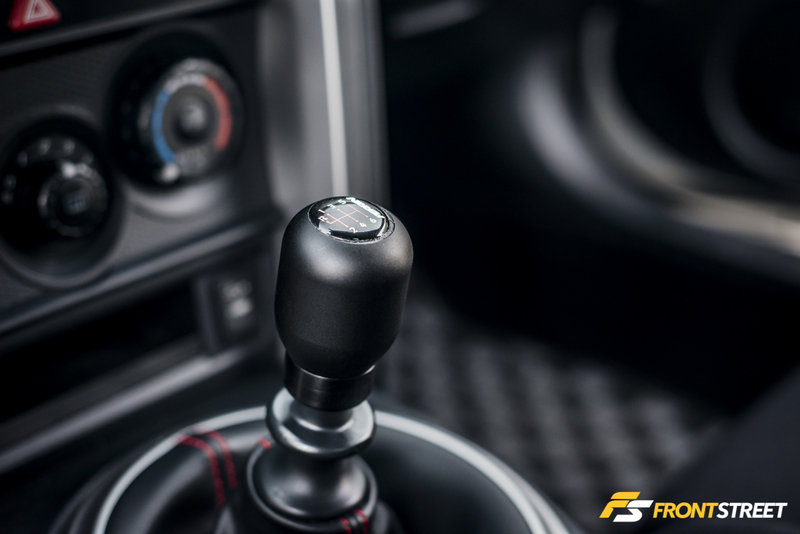 After going to a local auto show, he had the opportunity to sit in the recently released Scion FR-S and a couple weeks later he was driving one off the lot. 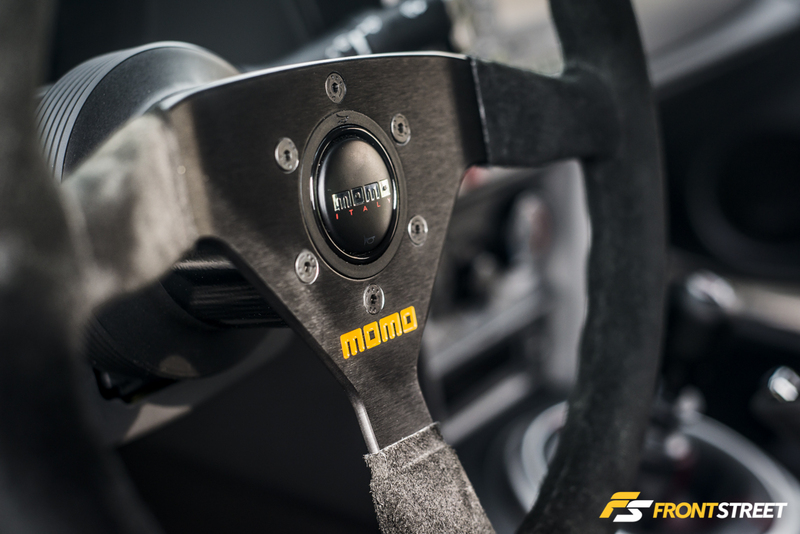 The exterior of the car has been through a few different phases since ownership, with the current setup being the most extensive. 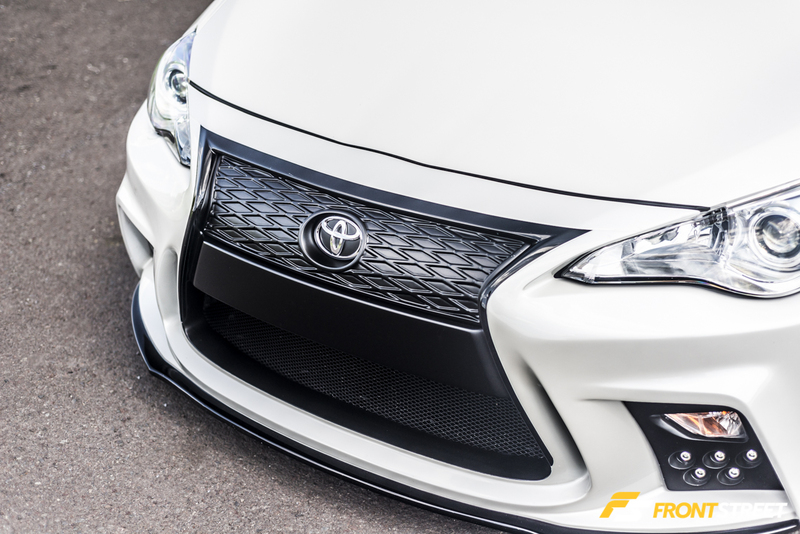 The front end has an undeniable presence thanks to the Aimgain LF-Sport front bumper, which mimics the new Lexus spindle grill design. The aggressive lines of the bumper match the stock design of the car so well. 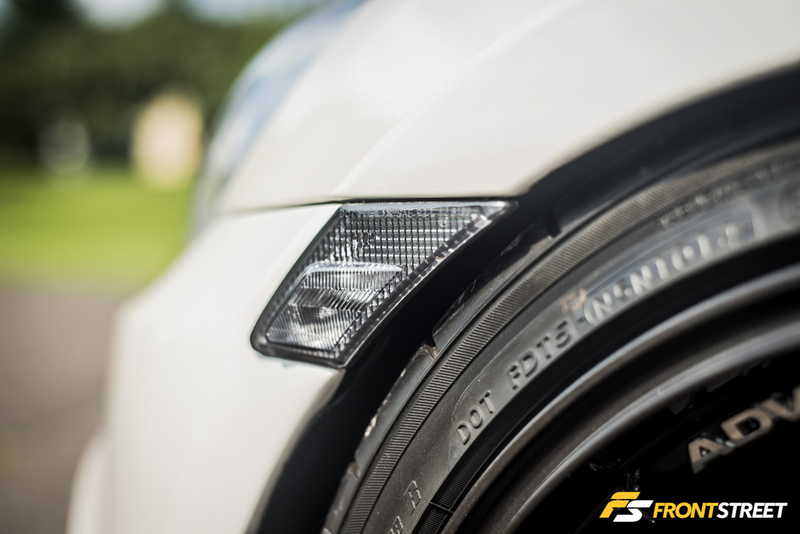 This bumper also incorporates the stock Scion bumper lights into its LED foglight setup. The car has also been through a few sets of wheels since ownership, currently resting on a setup of Yokohama Advan pieces. 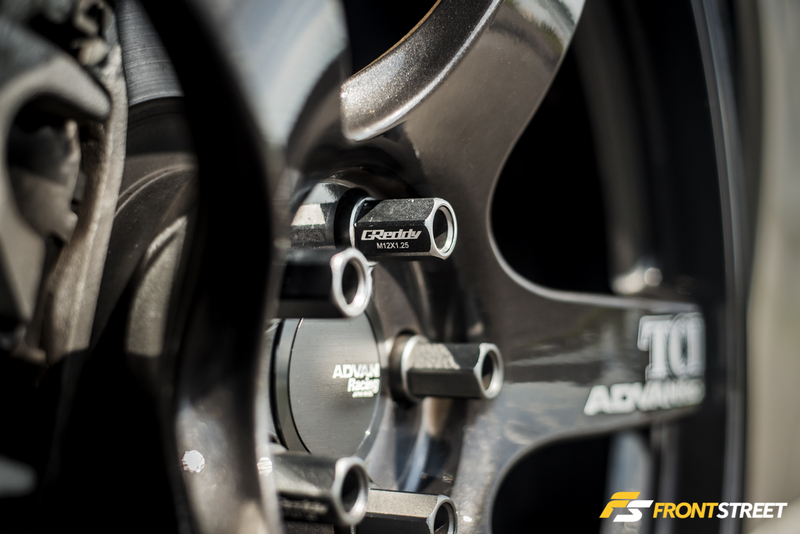 The Yokohama Advan TCIII wheels unfortunately aren’t available without a polished center lug nut area. Being a fan of the TCIII design other than that detail, he purchased a square set of in 18” x 9.5” ET45 sizing. Then had the brand new wheels powdercoated to a solid gunmetal grey color. 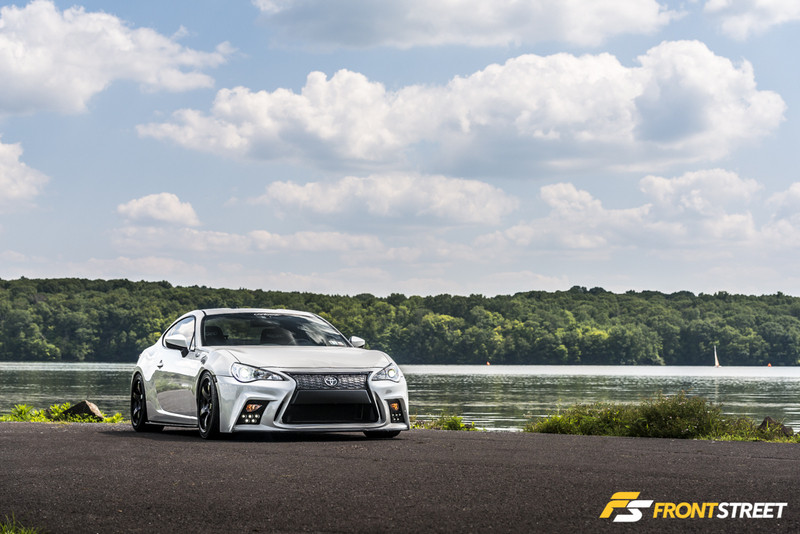 The wheels are wrapped in 255/35/18 Yokohama Advan AD08-R tires, and adorn gunmetal GReddy lug nuts to hold them in place. The lighting on the car has been replaced at every corner. 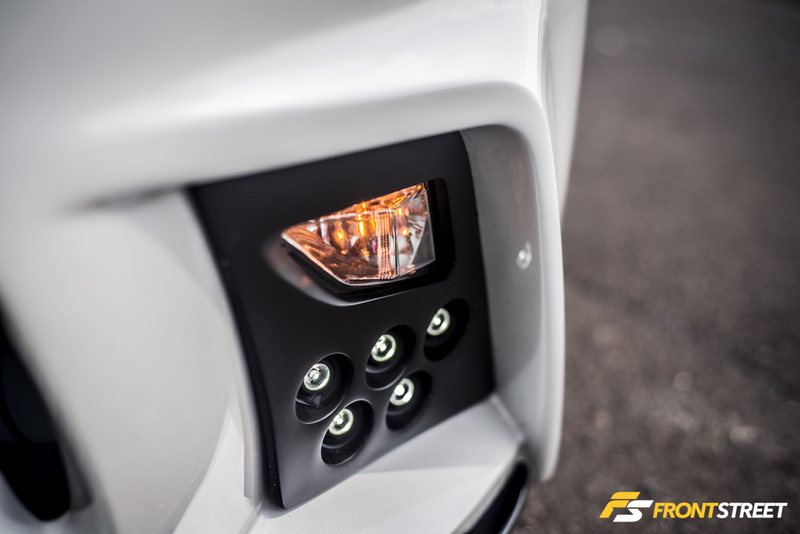 The 6k HID headlights, and LED fog lights in the front provide enhanced vision at night. While Helix smoked side markers match the contrasting dark tones throughout the car. 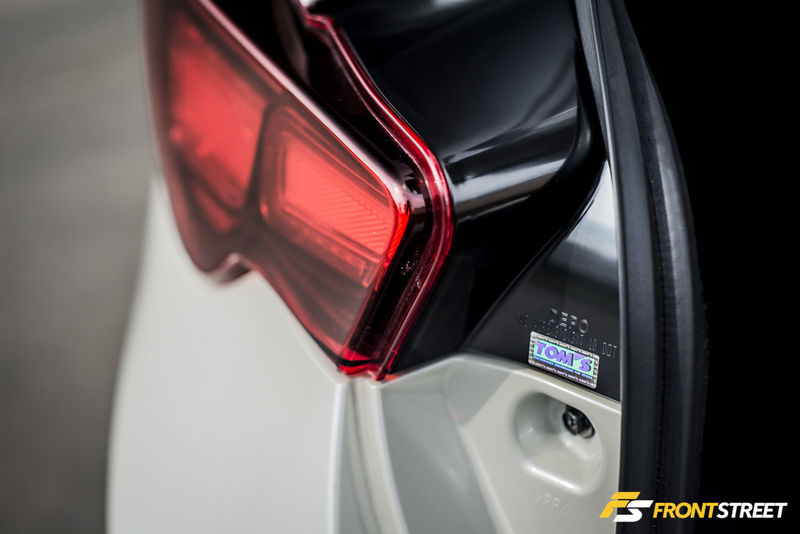 Tom’s LED taillights give the rear a distinct look in any lighting situation. Also discarding the stock chrome trim found on the FR-S for the solid red. 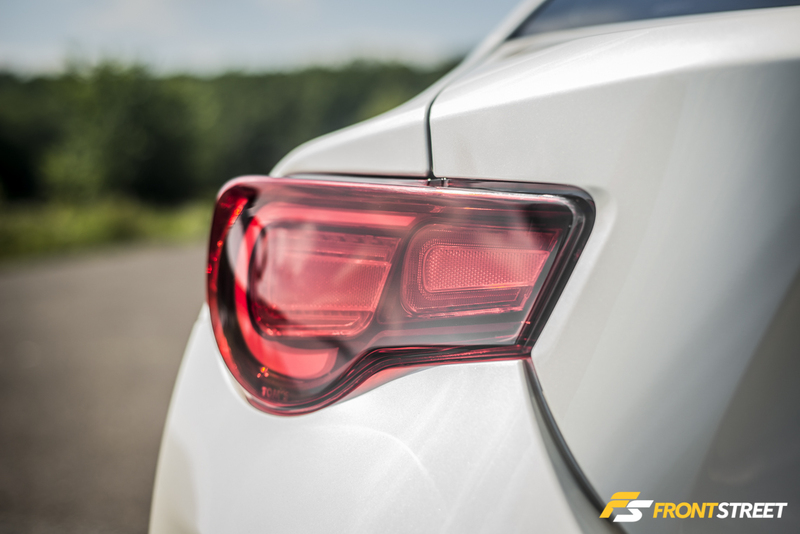 But it’s not just the taillights that grab your attention in the back of the car. 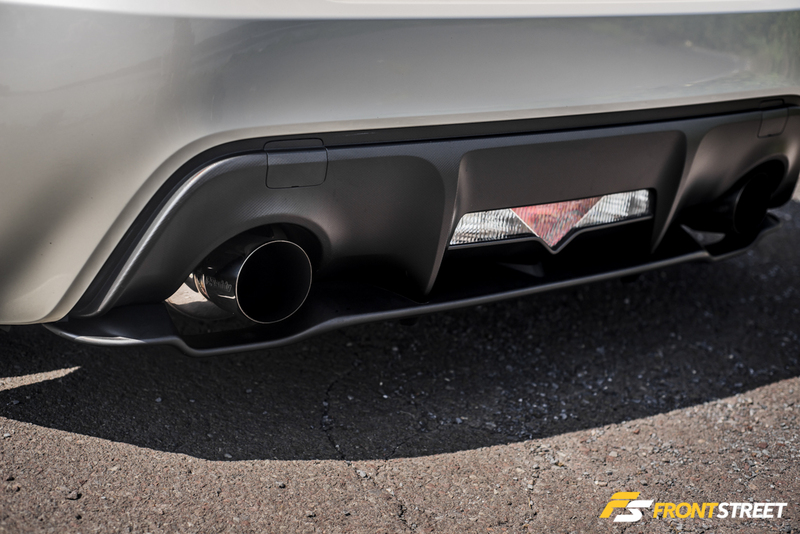 The OEM Subaru BRZ rear diffuser adds an even bottom line of aerodynamic design. 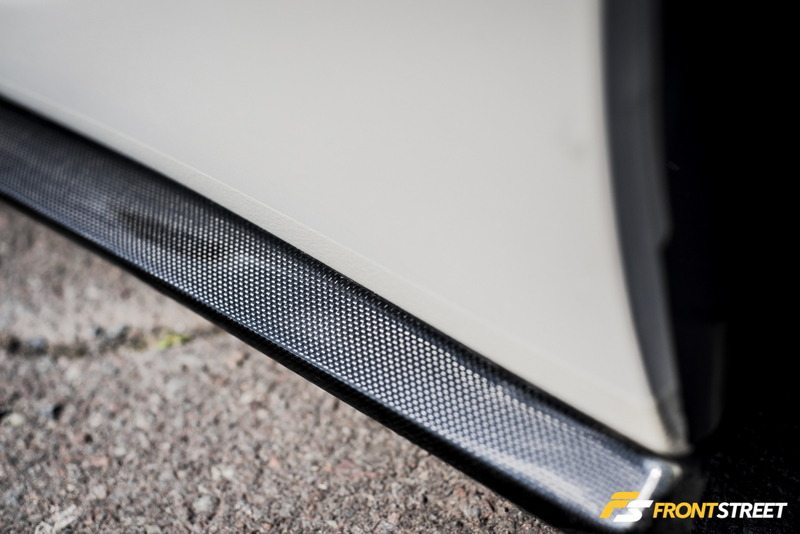 This line flows around the entire car thanks to the Downforce carbon fiber side diffusers. 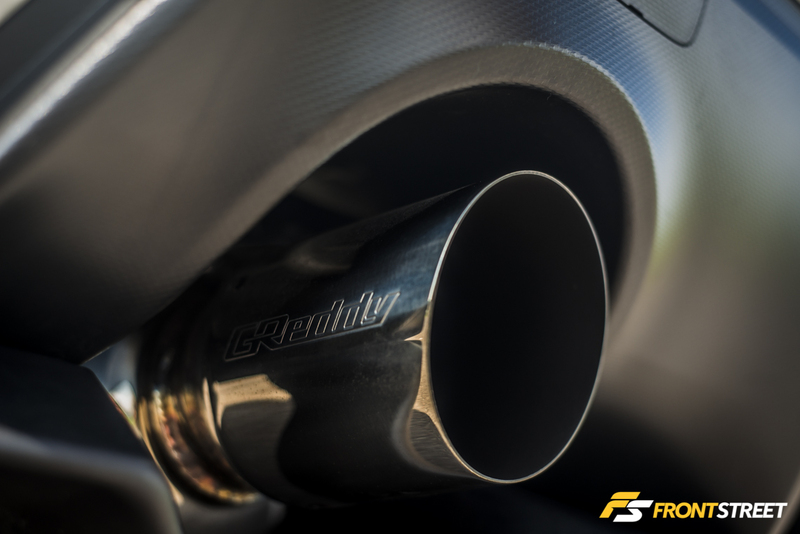 Peaking from just above the rear diffuser is the GReddy EVO3 dual exhaust which gives the flat 4-cylinder 2.0L FA20 a low growl in every RPM. Not being able to let go of his Honda roots, Jesse uses Mugen Power bolts to secure his license plate. 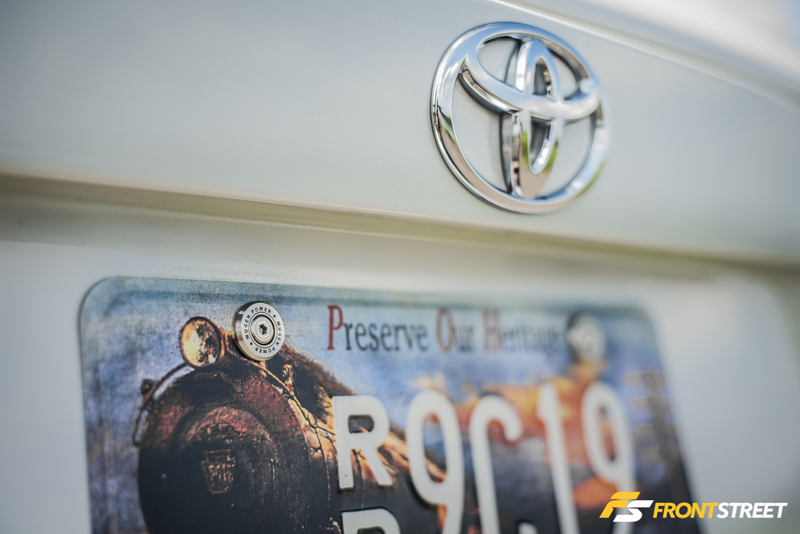 Also, notice the Japanese Toyota badge, which can also be found fastened into the Aimgain bumper in the front. 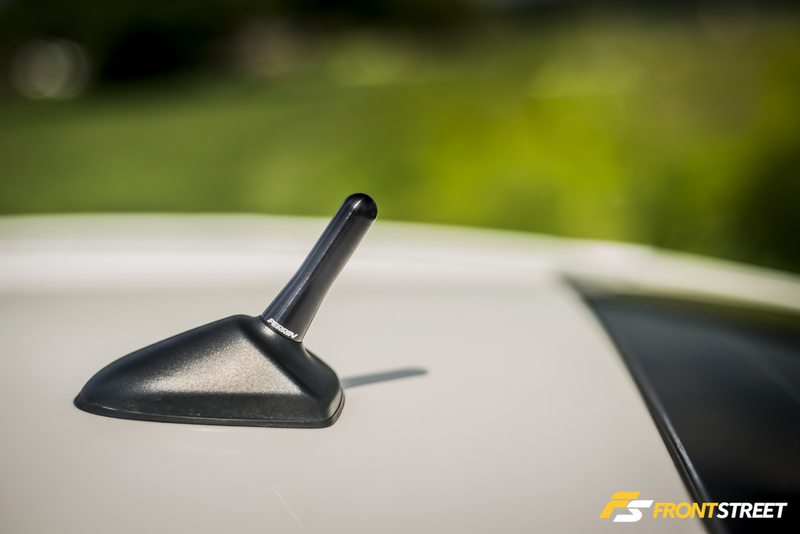 The stock antenna was also removed in favor of the Perrin 2″ shorty antenna that currently resides on the roof. 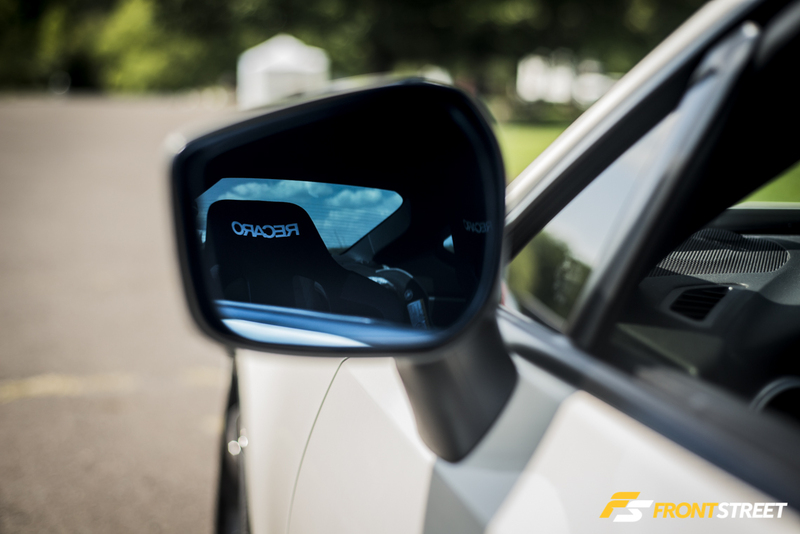 These blue tinted Rex Speed concave side view mirrors give a glimpse into the inside of this FR-S.
Once inside, the suede Momo Mod78 steering wheel begs to be gripped. 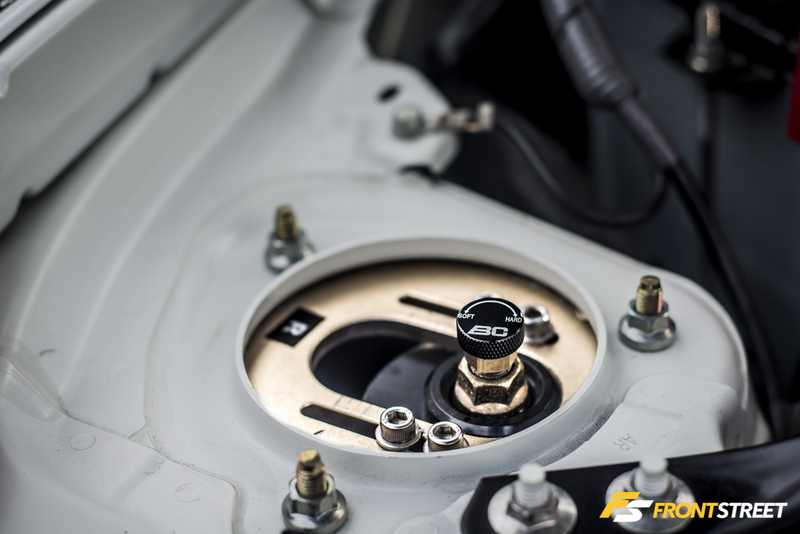 It’s mounted on a Works Bell hub and protrudes closer to the driver via a Works Bell Hub Extension. 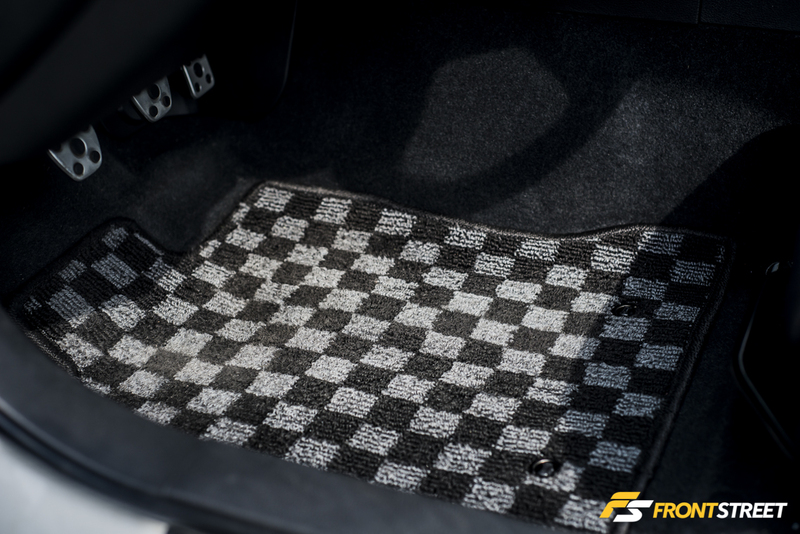 The next points of contact for the driver being the Perrin shift knob and the Version Select checkered floor mats. 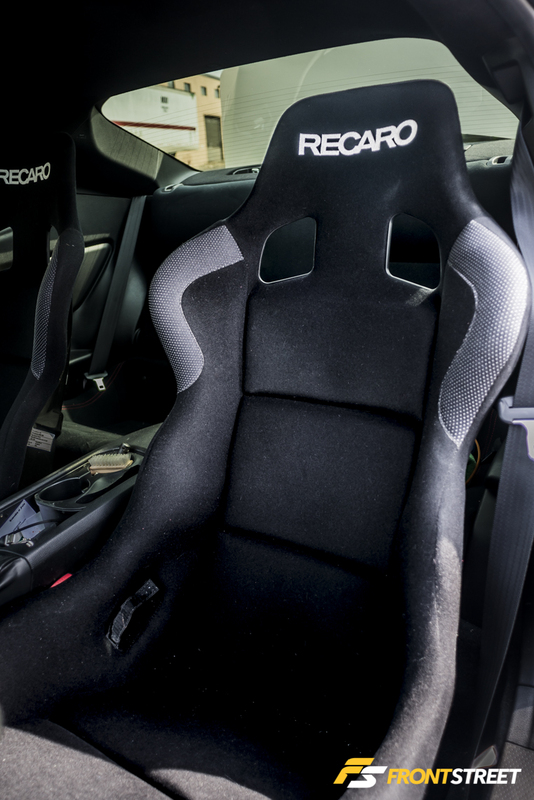 All while nestling into the Recaro SPG-XL racing seats, mounted to the chassis using Buddy Club seat rails. 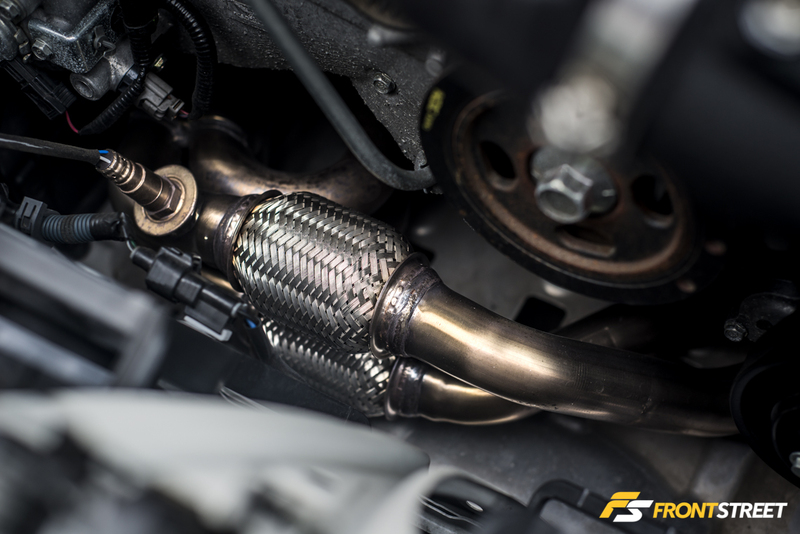 With the hood popped, the engine tuned on ECUTek looks a lot like any other FR-S but hidden beneath the cosmetics is a full exhaust system. Starting with this Borla unequal length header, which feeds into an Agency Power over pipe and cat-less front pipe. 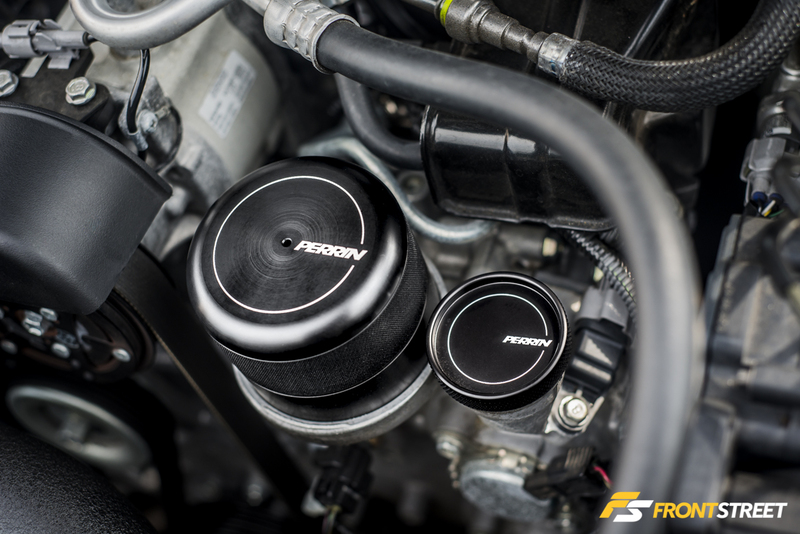 The drivetrain also sports almost the entire line of Perrin products for the car including: engine mounts, shifter bushing, transmission mount, oil cap, oil filter cover, and “BigMAF” intake system. 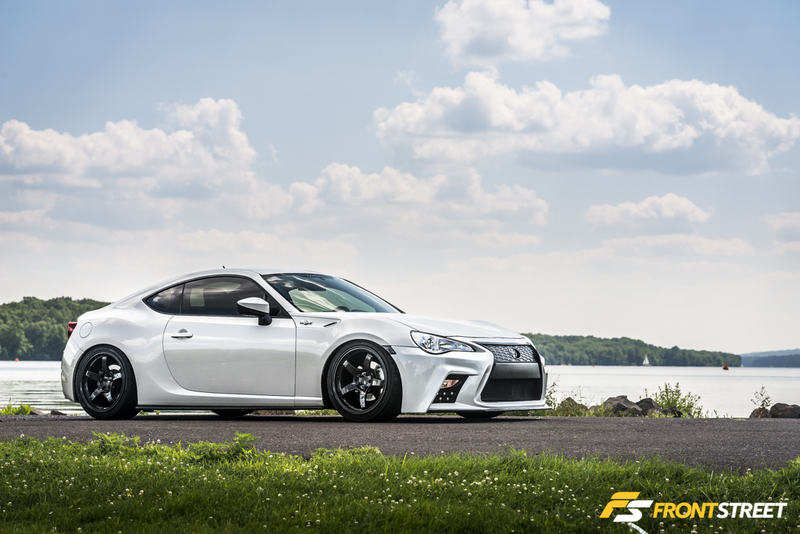 Finally, here you can also see the pillowball top mounts from the BC Racing BR coilovers that give this Scion its posture. 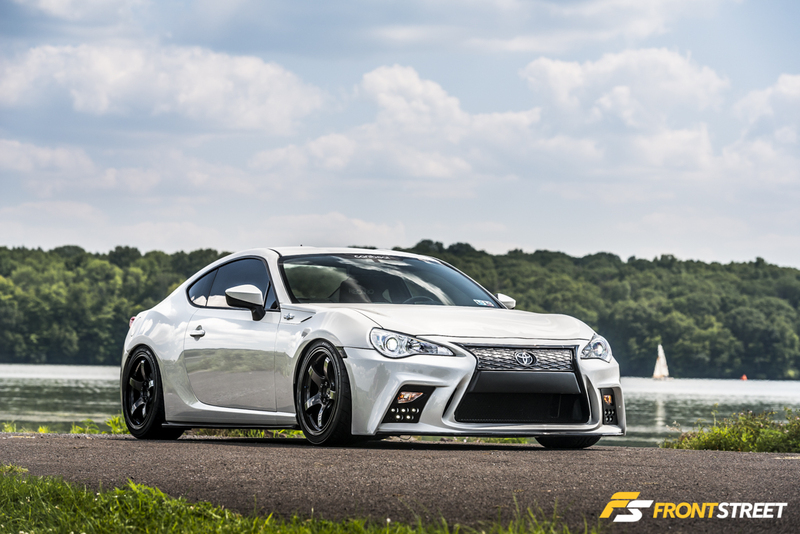 Jesse has plans for the future of his FR-S including a subtle rear wing, and some forced induction to complete the setup he’s currently running. 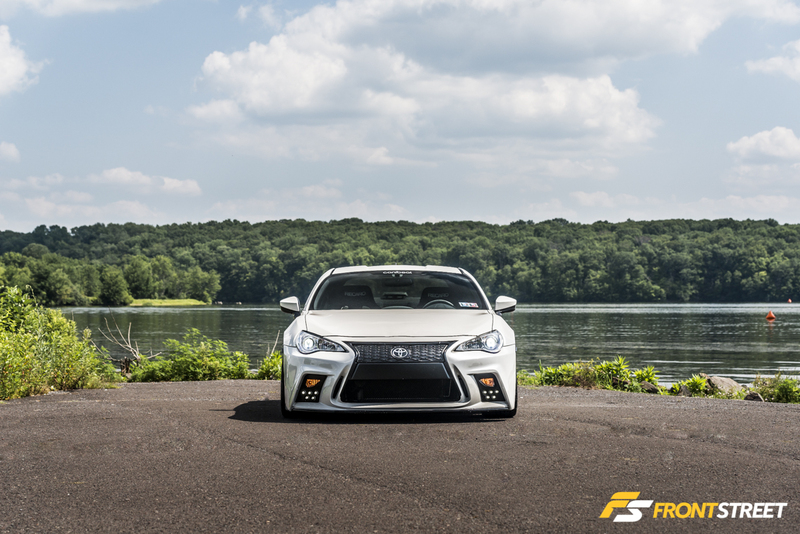 We think a front mount would look perfect in that bumper opening!